Fourth Row Center: Film Writings by Jason Bailey: On DVD: "Magic & Bird: A Courtship of Rivals"
The opening passages of the HBO sports documentary Magic & Bird: A Courtship of Rivals utilize gentle music, solemn narration, and deliberate pacing to a degree that verges on melodrama. C'mon, we're thinking, this isn't "The Civil War." It's a movie about a couple of NBA guys! In retrospect, once the film's compact but exhausting 90 minutes have come to a close, the tone of those early scenes seems absolutely appropriate. We're dealing with mythology here, with legends, warriors, and the film treats them as such. Like the best sports documentaries--Hoop Dreams, When We Were Kings, most of ESPN's current 30 for 30 series--Magic & Bird is about more than the game, much more. It's about the specific psychology of these two men, and how their rivalry was as much about the time and place where they lived as it was about them. It is a thoughtful, insightful, heartbreaking film. Director Ezra Edelman begins the story with Earvin "Magic" Johnson and Larry Bird's first face-off, the 1979 NCAA championship game, before backing up into detailed biographies of both men, rich with archival footage, photos, and insights from those who knew them. We see how their disparate backgrounds formed their personas--Johnson, a neighborhood star, was gregarious and outgoing, while Bird, a poor country kid whose father took his own life, was withdrawn and subdued. Those insights are all fodder for the film, which delves deep into the nature of their rivalry--their duality, their similarities and differences. And, above all, their competitiveness. Of that first NCAA game, in which Johnson's Michigan State Spartans bested Bird and the Indiana State Sycamores, Bird says, plainly, "It still hurts," and it clearly does. "Toughest loss I ever took." 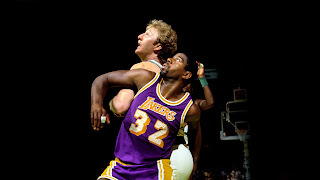 From that moment on, as the two men entered the NBA--Johnson for the Lakers, Bird for the Celtics--it was a game of one-upsmanship, an MVP honor for one, a championship ring for the other, the two of them engaged in a battle for dominance in the public eye, and in their own minds. But the film isn't just about the two men. It is about the environment of the NBA at the turn of the decade, in which sagging attendance and showboat gameplay had led to indifference among fans. It is about what each man brought to their team: Magic's energy, Bird's scruffy determination. It is about how, to some degree, the rivalry between the two men was seized on and exploited by television to boost drooping ratings. And, most compellingly, it doesn't shy away from the troubling racial overtones of the competition, examining the way that white and black Americans seized on the clash, and doing so with the finesse and acuity of a sociological study. Most surprising, though, is the penetrating psychological analysis of their relationship. "On the court," we're told, "they were doppelgangers," seeing themselves in each other, predicting each other's moves, playing off the kind of dedication that only the other could understand. Also key to their rancor is an understanding of the duality within Johnson himself; he and several others talk at length about his own split personality, between warm and friendly "Earvin" and competitive, ego-driven "Magic." This is rich, riveting stuff, and the analysis of the narration (written by Aaron Cohen, voiced by Liev Schreiber) is verbose yet concise, dense but brutally blunt. Sports fans needn't despair--the picture isn't all cerebral, and the on-the-court footage and moments of play-by-play are tremendous, thrillingly edited for maximum suspense (the rundown of the 1984 series is particularly sharp). The filmmakers find their bursts of energy there, while discovering the natural arc of a fiction narrative in the dark turns of the late 1980s: Magic's promiscuity, Bird's rapidly deteriorating body, and ultimately, Magic's unexpected diagnosis with HIV. The manner in which the film handles that final revelation, which obviously changes is everything, is sentimental but not dishonest--they've earned our trust by this point, and the climactic scenes (Johnson's determination, Bird's reaction, and their last hurrah in Barcelona) are genuinely moving. A good sports documentary is a tricky thing. To do one successfully, a filmmaker must satisfy both fans and casual audiences, dealing in analysis and minutia without getting lost in the weeds, delivering the drama of the game and the psychology of those who play it in equal proportion. On all those counts, and many others, Magic & Bird: A Courtship of Rivals is a smashing success, a genuinely engaging and surprisingly heartfelt retelling of one of the best of all modern sports stories. "Magic & Bird: A Courtship of Rivals" is available now on DVD.